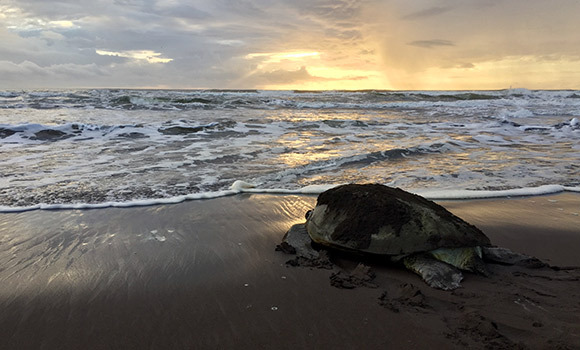 UNCG students collected data from sea turtles on the black-sand shores of Tortuguero National Park in Costa Rica. Traveling the world and saving animals once felt like a pipe dream to UNCG student Leanne Murray. But after a trip to the Sea Turtle Conservancy Tortuguero Biological Field Station in Costa Rica, that dream is within grasp. Ann Berry Somers and biology students at the Sea Turtle Conservancy Tortuguero Biological Field Station in Costa Rica. 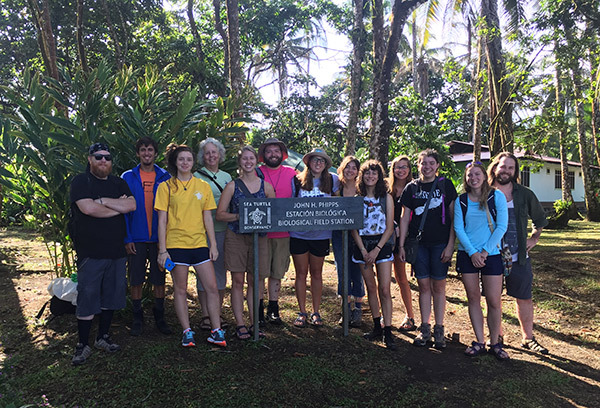 July 29 through Aug. 5, Murray and her classmates in Ann Berry Somers’ Biology 361 class had the opportunity of a lifetime tagging and collecting data from sea turtles bedded down for the night on the black-sand shores of Tortuguero National Park. The seminar and field studies course, “Biology and the Conservation of Sea Turtles,” began in Spring 2017 and along with Costa Rica includes a trip to The Karen Beasley Sea Turtle Rescue and Rehabilitation Center in Surf City, North Carolina. This allows the class to compare conservation efforts in North Carolina with those in Costa Rica. “This is the only sea turtles class I know of where students get experience with all five of the sea turtles found in the North Atlantic,” said Somers, senior lecturer and Lloyd International Honors College faculty fellow. The three-credit-hour course tops out at 12 students and has been offered to undergraduates every other year since 1996. Student Kim O’Neill initially had some reluctance about the level of physical exertion required for the Costa Rica experience – a fear that disappeared pretty quickly. The Surf City Rehab Center’s mission is to rescue, rehabilitate and release sick and injured sea turtles. It is one of only a few facilities in the U.S. dedicated entirely to sea turtles. Students assisted in the care of the turtles while learning about the causes of decline in U.S. waters. “I believe I have done a great deed for the sea turtles and feel very fortunate to have been a part of it,” said Biology major Aaron Wagoner. In late July, Somers and her students arrived by boat at Tortuguero, Costa Rica, a remote area on the Caribbean coast at the edge of a wet tropical rain forest. For 50 years, the Sea Turtle Conservancy has conducted annual sea turtle nest monitoring studies along the 21-mile beach, the nesting site of more endangered sea turtles than anywhere else in the Western Hemisphere. The monitoring program was initiated in the 1950s by American conservationist Dr. Archie Carr and has reversed the decline of green turtles in the Caribbean. Somers said she’s seen significant changes resulting from worldwide conservation efforts over the course of the 21 years she has taught the class. “The consequences of these changes are largely unknown, but certainly this is not just about sea turtles (and the course work emphasizes this), it is about the ocean ecosystems,” Somers said. In darkness, Somers and her students ventured along the beach, measuring the turtles after they inched toward the shore, counting eggs, tagging and recording data.